Heat oven to 400°F. Beat butter, granulated sugar and lemon peel in large bowl with electric mixer on medium speed, or mix with spoon. Stir in egg and milk. Stir in flour, baking powder, baking soda and salt. Drop dough by rounded tablespoonfuls about 3 inches apart onto ungreased cookie sheet. Press bottom of drinking glass on each until about 1/4 inch and 3 inches in diameter. Bake 8 to 10 minutes or until light golden brown. Immediately remove from cookie sheet to wire rack. Cool completely, about 30 minutes. 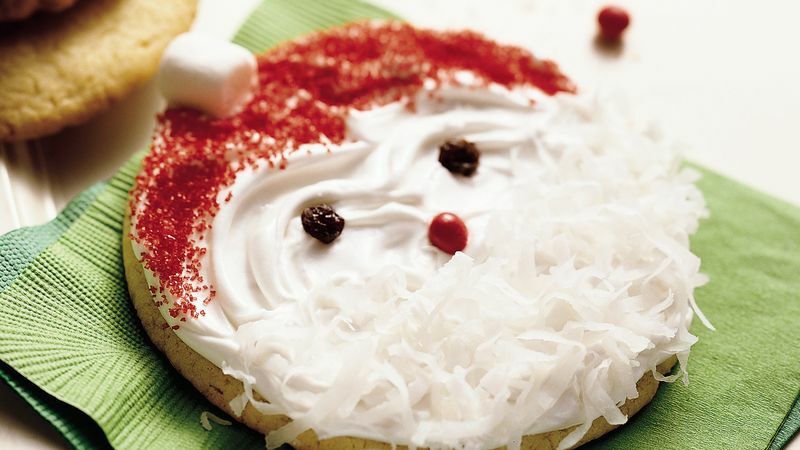 Spread frosting on cookie (frost and decorate each cookie before starting another). Sprinkle red sugar over top third of cookie for hat. Press on miniature marshmallow for tassel. Press 2 currants for eyes and 1 cinnamon candy for nose into center third of cookie. Sprinkle coconut over bottom third for beard. To keep the cookies perfectly round, be sure to drop the dough into mounds 3 inches apart so they won’t bake together. To make the edge of the frosting even, place some of the frosting in a heavy plastic food-storage bag. Snip off a corner, and squeeze out frosting to outline each cookie before spreading frosting inside the outline.